It doesn’t seem possible that JURASSIC PARK is 22 years old. The very fact that there are people reaching adulthood that weren’t even alive the first time those dinos rampaged through the cineplexes is the type of thing that makes me want to grab my walker and wither away in a rest home somewhere. And yet, those dinosaurs are still going strong, the subject of one of the biggest films of the summer, JURASSIC WORLD. So as we are wont to do, it’s time to look back at the first three entries in the JURASSIC PARK franchise, harkening back to a time when the characters and the technology was new, a time when dinosaurs ruled the earth. JURASSIC PARK (1993). Director: Steven Spielberg. Cinematographer: Dean Cundey. JURASSIC PARK (1993) – Somewhere in Costa Rican territory, on the isolated island of Isla Nublar, the wealthy and well-meaning John Hammond has created something magical. Using previously lost DNA strands, his scientists have begun bioengineering dinosaurs to be featured as the star attraction at a one-of-a-kind amusement park. But when one of the workers is killed, the insurance company gets skittish and Hammond has to call in a number of experts to swear to the park’s safety and authenticity. Hammond decides to show these experts how the park would operate. Hammond brings in paleontologist Dr. Alan Grant (Sam Neill) and paleobotanist Dr. Ellie Sadler (Laura Dern) while a skeptical and unscrupulous lawyer brings in self-described “chaotician” Dr. Ian Malcolm (Jeff Goldblum). Also joining the tour are Hammond’s own grandchildren. But a fierce thunderstorm and some industrial espionage within the InGen company take the park offline while everyone is touring the complex. Hence, they are trapped out in the park with the dinosaurs when their vehicles break down and the fences stop functioning. Throughout the 1970s and 1980s, Steven Spielberg reinvented the very idea of the event film. His films were big and full of special effects, but more importantly they were also full of a sense of magic. In 1985, Spielberg took a break from his event films to focus on dramas like THE COLOR PURPLE and EMPIRE OF THE SUN. Aside from the occasional INDIANA JONES sequel, Spielberg was moving onto other things. When he returned to the genre, it was with 1991’s ultra-disappointing HOOK. That film hurt because it was big without being special, it felt like the magic was gone. But with JURASSIC PARK, Spielberg came back in full force. He crafted a film full of thrills and special effects and most importantly, characters you really cared about. He has alternated between event movies and dramas ever since but JURASSIC PARK may have been the last time when his films filled the audience with a sense of awe, the last time one of these films felt truly special. The initial theatre experience with JURASSIC PARK cannot be understated, with its then state of the art digital surround sound. Hearing the thumps of the tyrannosaurus as he grew closer and closer and then came roaring out of the jungle is one of those unforgettable moments that gave you goosebumps. What’s really amazing about the film is the level of authenticity that Spielberg achieves. The plot is pretty farfetched after all but he makes it believable. One of the reasons the film works is that even in scenes that seem like they could come out of ALIENS, the dinosaurs are not monsters. They are animals acting on instinct and we unlucky humans are the prey. The park itself also feels real on a level that no other film has been able to replicate. JURASSIC PARK is an amusement park ride in itself. The release of JURASSIC PARK also marked the moment in time when everyone truly marveled at CGI. Despite getting some hints in the years before, JURASSIC PARK was the film that showed us what this technology could really do. Spielberg wisely chose not to use digital dinos for the entirety of these films and some of the most amazing shots actually involve the work of special effects wizard Stan Winston. Still, the wonder expressed by the main characters upon seeing dinosaurs in the wild rolled over into the audience. It was a whole new ball game. We were amazed by a technology that boldly declared that anything was possible. Filmmakers have spent more than twenty years since then proving this claim and as an unfortunate side effect, it sometimes seems like no one is amazed anymore. Highly Recommended. THE LOST WORLD: JURASSIC PARK (1997). Director: Steven Spielberg. Cinematographer: Janusz Kaminski. THE LOST WORLD: JURASSIC PARK (1997) – In the four years since the events on Isla Nublar, Dr. Ian Malcolm (Goldblum) has gone from rock star mathematician to pariah. His dire warnings about living dinosaurs and men playing god have ruined his reputation. He is summoned to the estate of the ailing John Hammond, where he is informed that an expeditionary team has been sent to Jurassic Park’s “Site B,” on the nearby island of Isla Sorna to observe and report on the dinosaur activity going on there. This was the site of the initial experiments and there are no fences keeping anything out. Alarmed, Malcolm sets off for the island not to help in Hammond’s research but to rescue the person who is already on the island, Malcolm’s own ex-girlfriend (Julianne Moore). Unfortunately, he is soon followed by the unscrupulous people who have taken over InGen, including Hammond’s own greedy nephew (Arliss Howard, who would be twirling a mustache if he only had one). This second team isn’t there to report on the island’s activity. They are there to capture dinosaurs and bring them back to the United States. Everything is hackneyed here, from the lazy setup to the lazy characters, almost none of which are interesting or fully developed. The kids in JURASSIC PARK were still likable and believable, even at the film’s most ridiculous moment when the elder sister displays her incredible hacking skills. With THE LOST WORLD we get Vanessa Lee Chester as Malcolm’s daughter. It’s not Chester’s fault really, but this is a character that feels like it was created by a focus group rather than a skilled writer. She is there merely to serve as peril without any attempt to establish her character. She also gives Spielberg an opportunity to shoehorn in his default messaging about the importance of being a good parent. This is a good message when it fits the narrative but by this time, Spielberg was starting to throw it into films where such a message only distracted and interrupted the natural flow. Hence, we are also treated to domestic squabbles between Goldblum and Moore, none of which advance the story or feel genuine. And don’t get me started on the gymnastics scene. The next movie would have to make a dream sequence dinosaur talk in order to top the absurdity of that moment. As for the rest of the characters, most of them fare no better. They are given names merely as an afterthought. Otherwise, you have Effite British Bad Guy, Sadistic Military Person, Female Scientist/Love Interest, etc. Meanwhile, Goldblum is stuck with a role that has him staring into the camera and delivering trailer-worthy one-liners. As for the good points, a sequence in which a truck dangles over a cliff still offers entertainment value, even if it doesn’t have the same oomph it did back in 1997. The film’s best asset comes in the form of the late Pete Postlethwaite, who defies the shabby screenplay and emerges with the film’s one truly remarkable performance. Awful. 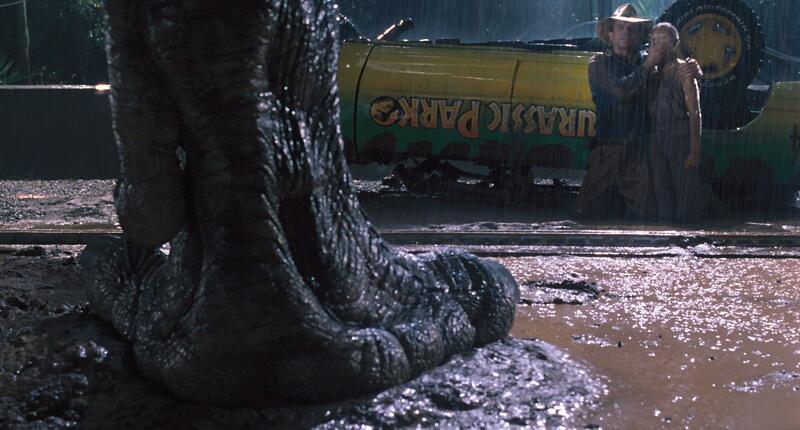 JURASSIC PARK III (2001). Director: Joe Johnston. Cinematographer: Shelly Johnson. JURASSIC PARK III (2001) – In this third installment, we are reintroduced to Dr. Alan Grant (Neill) who is back to digging up fossils and begging for grant money. He is approached by a wealthy couple (William H. Macy and Téa Leoni) who want Dr. Grant to fly them over Isla Sorna, the infamous Site B of InGen’s genetic experiments. Despite his attempts to distance himself from the events at Jurassic Park, Grant needs the funding. He grabs his new assistant (Alessandro Nivola) and the two accompany their supposedly wealthy benefactors over the island. Grant is startled however when the couple lands on the island against his orders. What’s more unsettling is that the couple doesn’t seem the least bit interested in the island’s dinosaurs. They are only interested in finding their missing son, who disappeared while parasailing with a family friend. JURASSIC PARK III starts out more suddenly and some might argue more cheaply than its predecessors. It actually cost more than the previous installments, but rather than give us a long effects film about genetic experimentation, this is a no fuss no muss adventure film. No need to make any big plans because the end credits start rolling at 84 minutes. The film is far better at establishing and re-establishing characters than THE LOST WORLD. It’s great to see Sam Neill back in the franchise, though it is disappointing that early scenes establish his Dr. Grant character did not end up with Dr. Sattler (Dern, making a brief return appearance). It’s a disappointing move and one I’m pretty sure no one wanted to see. 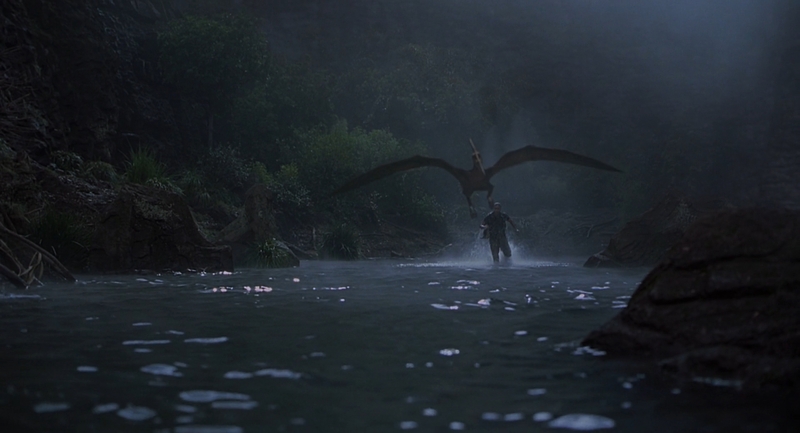 The last shots of JURASSIC PARK gave us a clear picture of where these characters were headed. JURASSIC PARK III disrupts this so we can focus on yet another loner, scarred by the events of the first film. But we’ve seen that movie already. We get some decent new characters and this time, the kid feels more than a plot device. The bonding between Dr. Grant and the child feels genuine. But we’ve seen that movie too. 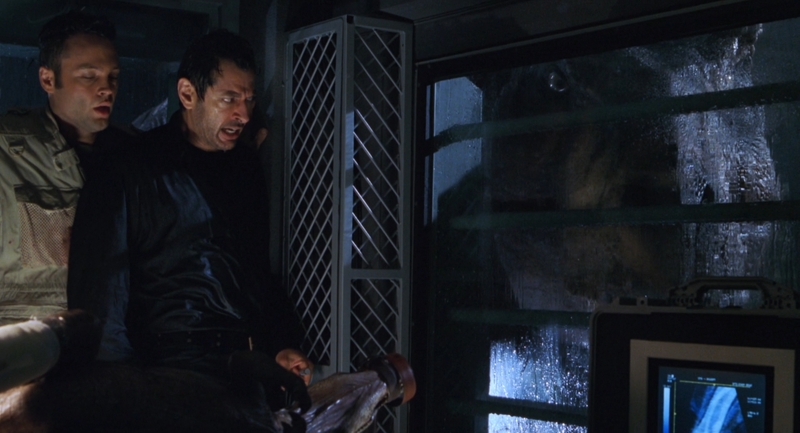 JURASSIC PARK III spends most of its time putting its characters in perilous situations so they can be attacked by strange dinosaurs, some of which we have not seen in the franchise before. The most memorable sequence involves an attack in an aviary by a group of pterosaurs (not pterodactyls as I was raised to believe all flying dinos were called). The film’s main attraction is the Spinosaurus, a creature larger and more ferocious than the T-Rex. One of the characters briefly wonders how such a dinosaur could exist here since it wasn’t on any of InGen’s manifests, but we don’t get any answers. Instead, director Joe Johnston would prefer you just sit back and enjoy the ride. And honestly, there is a lot to enjoy here, but it’s not the type of stuff that will stick in your brain. JURASSIC PARK III is a decent summer adventure, directed by a guy who really knows his stuff. Just don’t be surprised if you can’t remember much of it once it’s over. Barely Recommended. That brings us up to date on JURASSIC PARK. 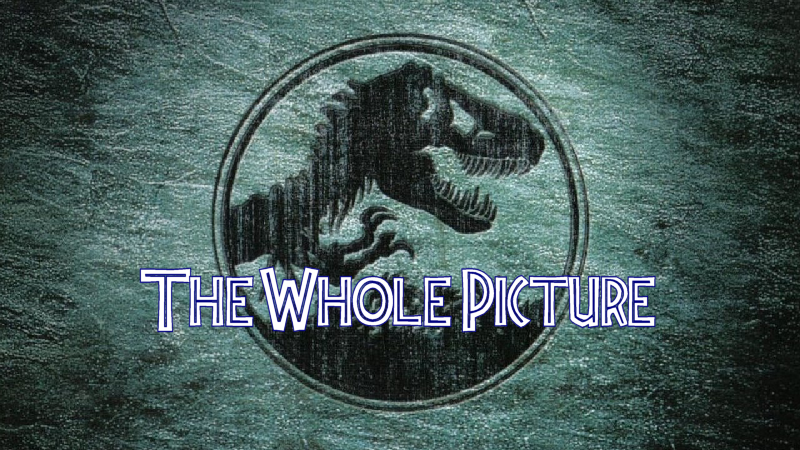 It doesn’t seem like fourteen years has passed between JURASSIC PARK III and JURASSIC WORLD. Maybe that’s because JURASSIC PARK never really left. There has always been talk of reviving the franchise and new generations are already being brought up on the original films. As this new chapter hits theatres, there is little doubt that it will be one of the biggest films of the summer, if not the year. And I have a feeling that even this will not the last we’ve seen of these genetically modified dinos. If this films prove anything, it’s that extinction is merely temporary.